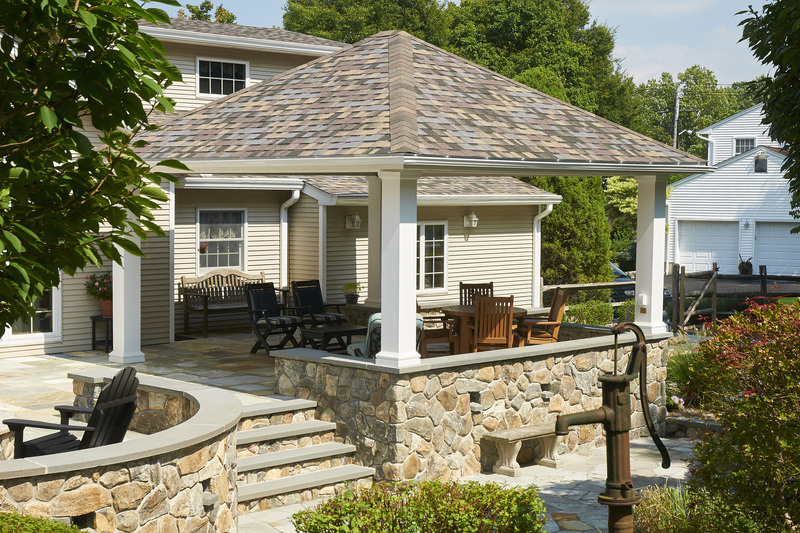 Create the ultimate outdoor living space with a gorgeous new pavilion in your backyard. Pavilions provide outdoor living at its best. Enjoy your backyard on hot days by staying cool in the shade. Don’t worry about cancelling plans due to weather. Rain or shine, a backyard pavilion gives you the flexibility to stay outside and spend more time outdoors with family & friends. Visit our photo album to see more pavilion designs and inspiration. Pavilions are sometimes referred to as gazebos, pagodas, or rotundas. Typically though, a gazebo is a more rounded structure, octogonal in shape, and while it has open walls like a pavilion, a railing sometimes runs the circumference of the structure, enclosing it more than a traditional pavilion. If you're looking for an open-air design, a pavilion is the way to go. There's nothing quite like an outdoor living room. Relax, de-stress, and enjoy comfortable time together with your family and friends outside the walls of your home and energized the way only outdoor living can give! 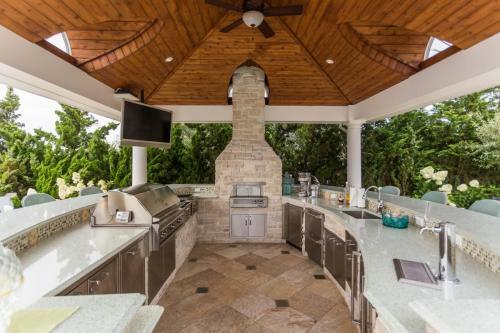 Go beyond the ordinary with an outdoor kitchen. Cook a romantic dinner, grill outside with all the convenience of a kitchen, or serve up some great eats for your guests. Make it easy for your visitors to grab a drink and feel at home. An outdoor kitchen makes entertaining a breeze. 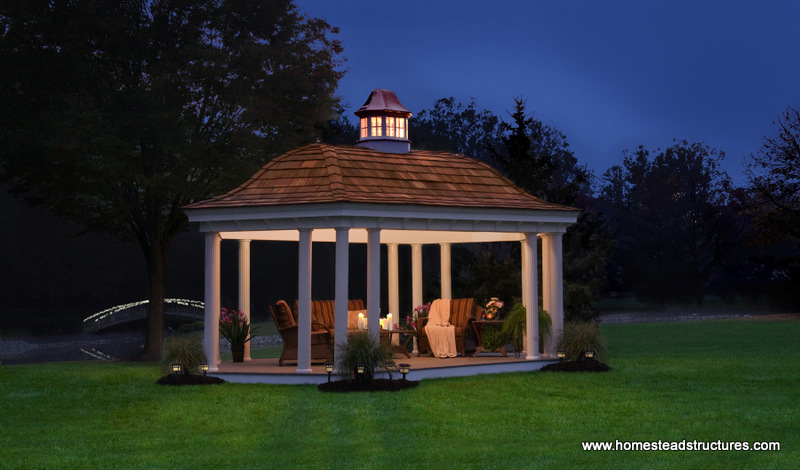 A pavilion is more than a beautiful structure, it’s a classy yet practical place to entertain outdoors all while providing a beautiful backdrop for your landscape and a lasting, sheltered backyard oasis. 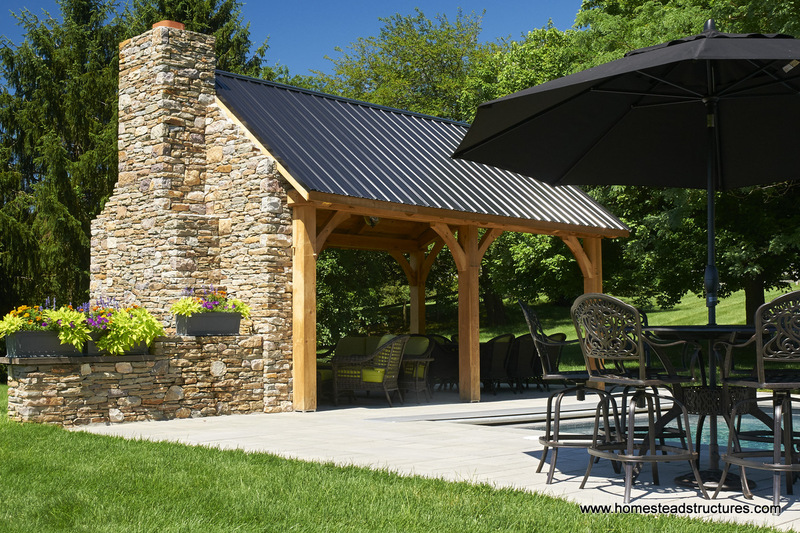 Amish-built, with quality you can trust - contact us to design a custom backyard or poolside pavilion that's uniquely suited to your tastes and we'll help you design the create the backyard oasis you've always dreamt of! Call 877-272-7252 today or fill out the form at the top of the page to start designing your new outdoor entertainment space. Entertain in style with our elegant outdoor pavilions and gazebos! Perfect for those summer barbeques, backyard parties or sharing a relaxing evening with the ones you love. Our backyard pavilions are also make an unforgettable setting for romantic outdoor weddings! Imagine lounging in the shade on a hot summer day after a refreshing swim in your pool. A pool pavilion can provide shade from the sun during the summer months and shelter from rain so you don't have to cancel your entertainment plans. Incorporate a fire place or fire put into your custom pavilion design and you'll enjoy your new pavilion all year round! Choose from our standard pavilion styles, or let us bring your custom vision to life! 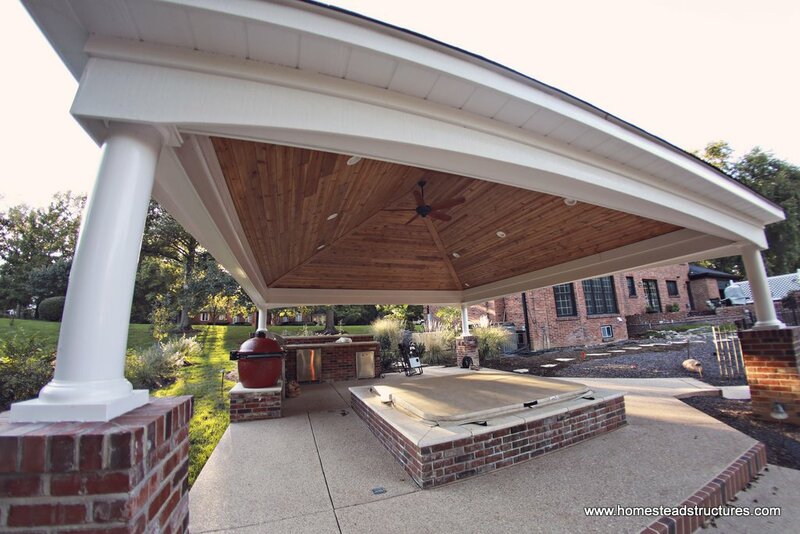 We'd love to create a one-of-a-kind, custom pavilion for your backyard. 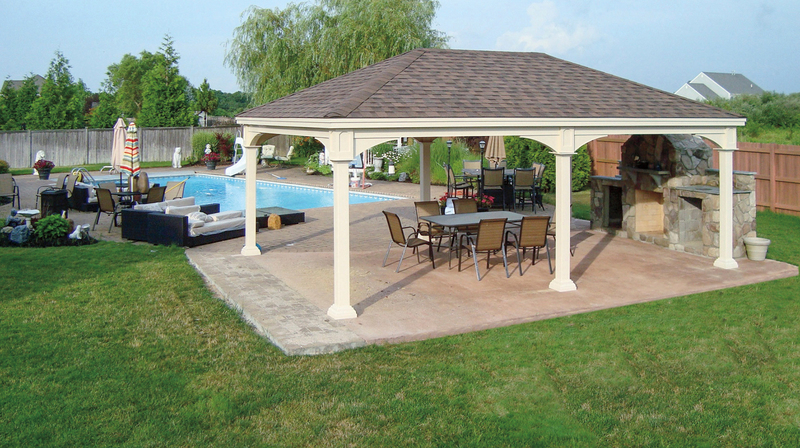 Enjoy the durable construction, elegant designs, and stylish features of our outdoor pavilions for years to come!